Abstracts and reference lists may contain minor errors and formatting inconsistencies. Please contact us if you have any concerns or questions. What is a Digital Object Identifer (DOI)? 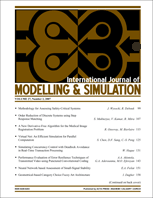 This journal was first published in 1981 and covers languages, hardware, software, methodology, identification, numerical methods, graphical methods, VLSI, microcomputers in simulation, and applications in all fields. It appears quarterly. To obtain submission information, please click here. To submit a paper, please click here . No Acceptance rate information available.